For more events in the Southeast or others that may not be listed here, click here to visit the AKA Region 4 web site. There are also links to the last couple WACKOS years at the bottom of the page. 8th - There was a little flying today but the wind was brisk and cold and variable as usual. But we were flying and it was worth it. 22nd - Tthere may not have been much flying with everyone preparing to spend Christmas with family and loved ones. We hope everyone has a happy holiday season. We'll see you all next year. 1st - Cool weather and variable winds, but we had some fun at times. Typical Frank Liske day - a few minutes of frantic flying between long bouts of no winds. 15th - the fourth weekend in a row of WACKOS flying! Too bad the weather didn't cooperate. Early on there was a little rain - all day was gray and cloudy and the wind never showed up. The storm in the middle of the week sucked all the wind out of this area. But lunch at Louie's was pretty good. This Saturday, Oct. 4th, found the flying field a bit deserted. But, those who were there had a wonderful time. Doug, a friend of Marty's, flew his Rev; I (a bit under the weather having just gotten my flu shot the day before) had up a few of my simple single liners; and the main story... Stu. The winds were like they've been for the last few times, strong..a bit gusty..with some empty pockets. Along with his Navy jet plane, Stu was flying his Totally Made By Georgous French Women With Soft Caressing Hands stunter and was burnin' up the field. I stoped my flying a bit early just to watch. With an audience of one, he made that kite dance to his tune (often exclaiming... wow that is the first time I have done that... or I've never been better!) Those who attended to family biz and who were at the convention may have had a productive day and seen some wonderful stuff, but I'll tell you ... there is nothing like seeing one of your own hitting the high notes. :) See you all on the field again soon!" News Flash! I just got some reports from the folks that went to nationals. See the report and some pointers to photos by clicking >> AKA 2003 by the WACKOS. 18th - We'll see what the weather brings. Sure hope there are some pictures from Dayton. 25th - Carolina Kite Fest in Atlantic Beach and Beach Fest in Holden Beach. Wherever you go, have a blast! I've received some pictures from both events. Check them out by clicking >> here <<! 6th - We wuz there. Where was you? Winds were light, as usual, but there was some good light wind flying today. 20th - A pretty good day with occasional stiff breezes and plenty of color in the sky. But there were breaks in between the bursts to sit and talk. Nice day. A new to the WACKOS flyer, Scott, came out to fly in the state where we celebrate the first flight. After that comment, let's see if he comes back. 29th - AKA National Convention starts in Dayton, Ohio. 2nd - FLP - Hot and humid, but there was a light breeze, more than enough if you wanted to fly a light wind stunter or fighter. 30th - No, the Hatteras Light has nothing to do with the event this weekend but I wanted to get your attention. Bonus! Labor Day Weekend. There's a HUGE event on the 31st. at Beech Mountain in the NC mountains called the Mile High Kite Festival. there's some information on the AKA Event calendar. Will Smoot ( willsmoot at ntelos.net ) can also give you lots of information. According to Will, "Activities are scheduled from 10:00 am to 4:00 p.m. on Sunday August 31, but if anyone wants to fly Saturday or Monday there will be people around that are likely to join in. We will be flying on the top of the mountain where Route 184 crosses between the Chamber of Commerce building and the Pizza place. There is also a wind generator near the road that is a good landmark." This event promises to be big fun. I've heard there may be 20 or more flyers and some big stuff in the air. If you're anywhere nearby, come join the fun! 5th - Being the 4th of July weekend, there aren't liable to be many WACKOS around Charlotte. If you'll be around and want to fly, send out an email and see if anyone else could join you. Otherwise, enjoy your Independence Day and look forward to the 19th. 16th - Yes, it's the middle of the week, but there was a need for someone to go to Myrtle Beach to assist Dave & Susie Gomberg fly some big stuff. A couple of us went, helped fly some things and hung out with the Gombergs. Click ==> here <== for some pictures. 19th - Weather permitting, we will be back at Frank Liske this Saturday. Come out and make it a memorable day. Hopefully, the bush hog will run up and down the hill to ready the field for us. 14th - Wright Flight Centennial Kite Festival - Jim Martin will be there as will AKA pres Dave Gomberg. This ought to be a good time. 21st - This was a great day considering that the sun hasn't shown in this area for what seems like months! Bright, sunny skies were Carolina blue, winds variable and sometimes exciting, good flying and good friends. 5 of us had a great time flying and talking. It was a great day to celebrate the endless rains this Spring. 28th - If you want to fly someplace, let us know. 3rd - Nice day. Little rain in the evening though. 16th - Festival of Flight opens in Fayetteville, NC.Kitty Hawk Kites is holding a Kite Festival Saturday only from 11 - 6. The web site incorrectly lists Friday as a flying day. There will be WACKOS in attendance. For anyone that can't make the Fayetteville Festival of Flight, this is our regular 3rd Saturday scheduled fly at Frank Liske Park. Please let everyone know if you will be flying at the park. 30th through June 1st - Statesville Balloon Rally.Good time & decent weather. Anybody have any pictures to share? 5th - Club Fly and official National Kite Month " "Big Kite Thang" . Well, it turned out that a few people didn't get the Saturday cancellation message, showed up for a beautiful-if-soggy-fielded Saturday afternoon fly once the rain stopped. More showed up on Sunday, including a reporter from FOX news locally, and the weather was about as good as it gets for kiting this far inland. Does this mean we can claim our first two-day festival??? Due to some logistical confusion and the shorter flying day Sunday (we didn't start until noon), most of the organized activities sorta vanished -- although we did get the spinsocks signed for sending out to our troops in Afghanistan and the Persian Gulf. Although clearly I won the Rok fight, it never actually took place. Ben Martin has been tentatively declared the winner, on the grounds that he actually had an assembled rok laying on the field, and nobody else put one together at all. In the women's division, the case is even weaker -- but Kathren is claiming a walkover since our other potential female fighters in attendance couldn't walk due to injuries. Kat claims walking is an integral part of Rok fighting. There are only a few pictures but that's better than none. Grumpy provided some and Doug L'H. sent the one with Grumpy untangling the Ghost Delta from the Flowform. Click here to see the pictures. 19th - Club Fly - NKM rain date. 26th - Mighty Kite Flight in Flat Rock, NC - To get there, take I-26 West to exit 22 go west off exit to Spartanburg Hwy (approx 1 mile) go south on Spartanburg Hwy (also known as 176) to Blue Ridge Road (approximately 1 mile) turn right or west on Blue Ridge Road go 3/4 mile field is on your left! A nice ride from Charlotte to get to I-26 is to take I-85 to the exit for US 74 around Kings Mtn, through Shelby and on to I-26. It gets slow around Shelby but it's mostly interstate-like roads. 1st - Brisk and cold, but windy. It was fun until the rain started. Hope it's warmer next time. 22th - Lake Park Kite Day, Lake Park, NC. Lake Park Kite Day has been a lot of fun the past few years. Blue skies and warm sun, swirling and variable winds that were sometimes great. There were lots of families from the community and they were all flying something. There were high flying deltas and diamonds, several biplane kites and kids, Moms & Dads running around all over the place. We've been warmly welcomed at Lake Park Kite Day so lets get out and have some fun. Bring your single line stuff to Lake Park, there really isn't enough room to fly stunters safely. 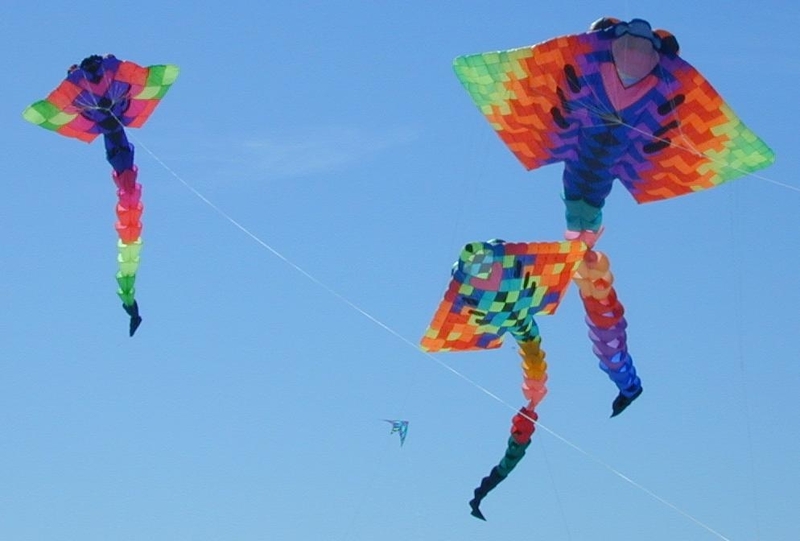 Check out the Lake Park web site at http://www.lakeparknc.com ; click "Event Calendar" and look for the Spring Kite Festival. See you there! 1st - There were some new Christmas toys out there today. It's amazing how so few people got so many new wind toys this year. 15th - This is coming up fast. Get your gear ready and head for the park in the morning. Unless it's pouring down rain, of course. 18th - 19th, Treasure Island Up in the Air Kite Fest. See http://www.freewebs.com/up_in_the_air/. I (Marty) went and I think Forrest was there, but I never met up with him. The 2003 festival was a pure fun festival with demos (with and without music), critter drops (also called 'animal droppings by Gary Resnick), candy drops, several rok battles and lots of fun. There was no sport competition this year, for many reasons, but everyone had a great time. Sandy & Dirk had 'Olympic-style' ribbons for the events, Tom Mason supplied the music and Maggie Engvall did a fine job as head judge and medallion presenter. The awards reflected the tone of the festival. In the high fly contest, for example, there was a highest flyer award (naturally) but there was also an award for "lowest flyer" and "the rok that flew like a rock". I had a great time and didn't miss the competition at all. The highlight for me was Sunday. Gary Engvall and I flew all three sizes of the Peter Lynn manta rays together . And I have some 'family' pictures to prove it. Click here to see one of them. Also on Sunday was the Rick Beaman Mass Ascension. In this form, the only condition was that you couldn't fly one of yourown kites.Ideally, you'd fly one of Rick's kites. See, when Rick gets a new kite, he always asks someone else to fly it first. He really likes to share his toys. What a great day Sunday was! WACKOS Year 2002 - Click here to visit those pages. WACKOS Year 2001 - Click here to visit those pages. WACKOS Year 2000 - Click here to visit those pages.